As a young child on my Scottish Housing Estate on the outskirts of Edinburgh in the 1960’s I marvelled at the western black and white television serials and later colour western movies each weeknight. I had always been fascinated with the Indians simply because they seemed to get the wrong end of the stick. Every young kid on the estate wanted to be a cowboy and I always wanted to play a Indian. And I found many of the serials boring when there was no Indian content. My first contact with the Little Bighorn Battle in Montana was in coloured comic book form and the front cover had a pile of dead soldiers with their regiment flag on top of the pile. In later years I pursued my passion for soccer and only after becoming a Margaret Thatcher Refugee in late 1981 did I once again continue my interest in the American West. I purchased “Black Elk Speaks” during a stopover at the Heye Museum in New York while heading back to Sydney, Australia shortly after leaving Scotland. And from that time on my goal was to travel the Great Plains and find out what really happened during the Indian Wars from 1854-1890 on the American Great Plains. (Pictured above is Bill Groethe in his photographic shop in Rapid City, South Dakota in 2008). And travel the Great Plains I certainly managed to do on seventeen occasions over a thirty-two year period. Clocking up 200,000 miles on interstates, highways and more than a few dirt and gravel roads. I knew that if I worked hard enough there was the possibility I might bump into individuals along the way who had personal contact with Indian War participants. 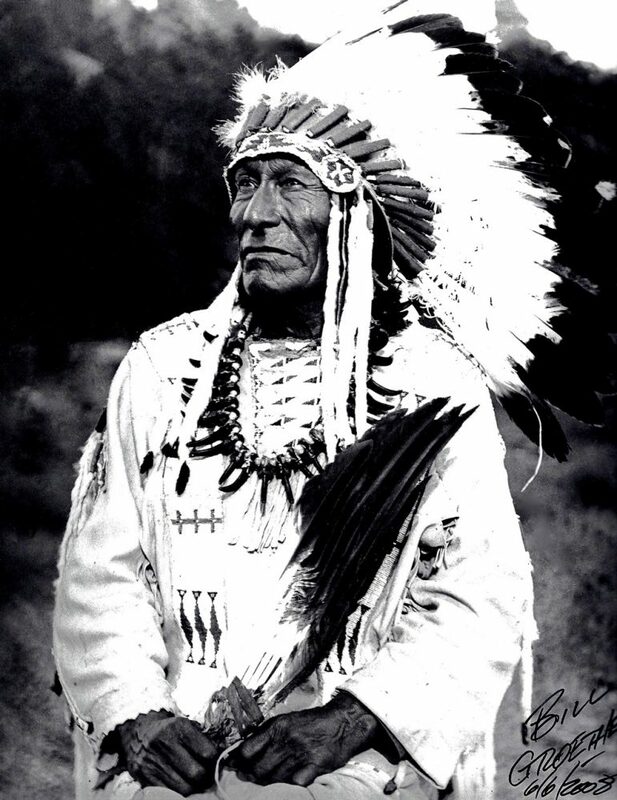 On a personal level I had meet and photographed Frank Fools Crow the Ceremonial Chief of the Lakota Nation at Cedar Lodge, South Dakota on the 25th of June, 1989. 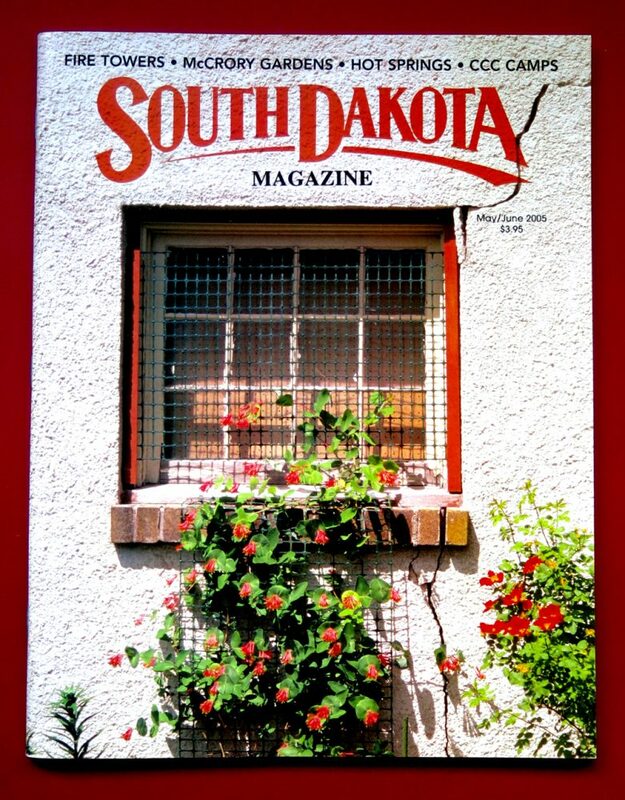 And after publishing the Cheyenne Hole booklet in 1991 Kim and I travelled the following year to meet with Caroline Sandoz Pifer the younger sister of Mari Sandoz. One of Caroline’s interesting tales is the time in 1930 as a young sixteen year old she travelled down to the Pine Ridge Reservation with Mari to meet and interview Chief He Dog the boyhood friend of Crazy Horse who was ninety years old at that time. 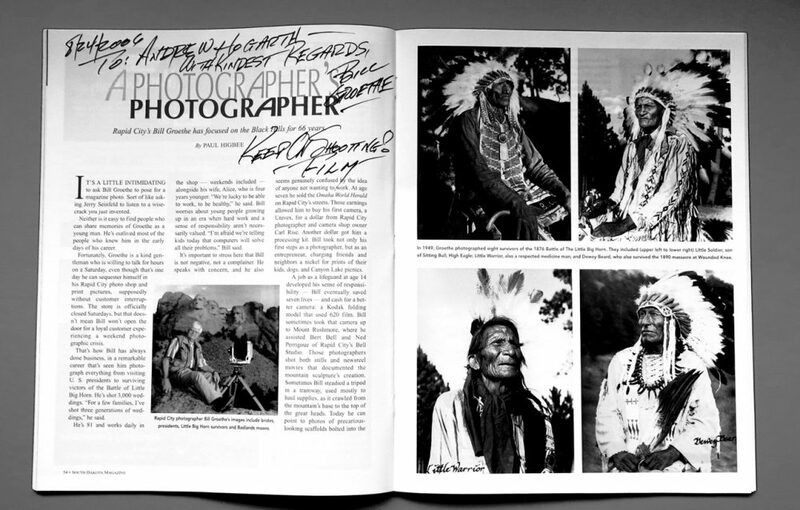 And while on the road in 1995 selling my four published books my friend Chuck Cochran a retired school teacher from Fargo, North Dakota who now owned and operated the Dakota Territory Trading Post in Custer, South Dakota had a signed set of black and white portraiture images of the last eight survivors from the Little Bighorn Battle. Chuck said that as a young child while travelling the South Dakota Badlands with his parents that they meet a old Lakota-Sioux man dressed in all his fine regalia at the roadside standing next to his tepee. The old plains nomad said to Chuck after having their photographs taken that he had fought at Little Bighorn and also Wounded Knee. The Indian was Dewey Beard and like all trading post stories I was fascinated to hear tales from the old west. 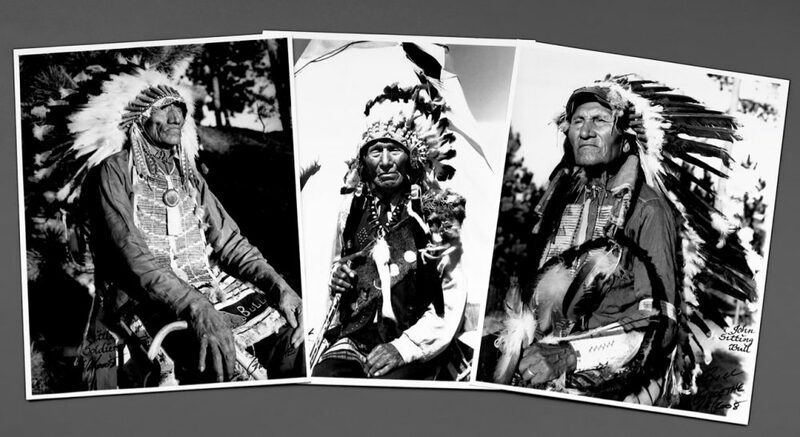 Chuck said that the gentleman who had taken the beautiful images of the Little Bighorn survivors was Bill Groethe and he lived in Rapid City, South Dakota. The next time that I was in Rapid City on business I made sure that I stopped by at First Photo on Main Street to introduce myself to Bill Groethe. When I walked into his photographic store I was immediately confronted by these large black and white images of old Lakota-Sioux warriors. They looked so regal and proud and the images recked soul and radiated power. Shortly a gentleman approached me and introduced himself at Bill Groethe the owner of the establishment. Over a cup of coffee Bill told stories about his interesting life up to that point. Bill said that his parents had given him his first camera at the tender age of ten years old. And from that moment on he revelled with his new found passion to try and create a quality image. At the age of twelve Bill was employed by Bell Studios in Rapid City and they paid more than his nickel a print that he was selling. Bill continued by saying that he worked as a World War II photographer and that at the wars end he returned home to South Dakota and started to document in imagery the construction of Mount Rushmore. 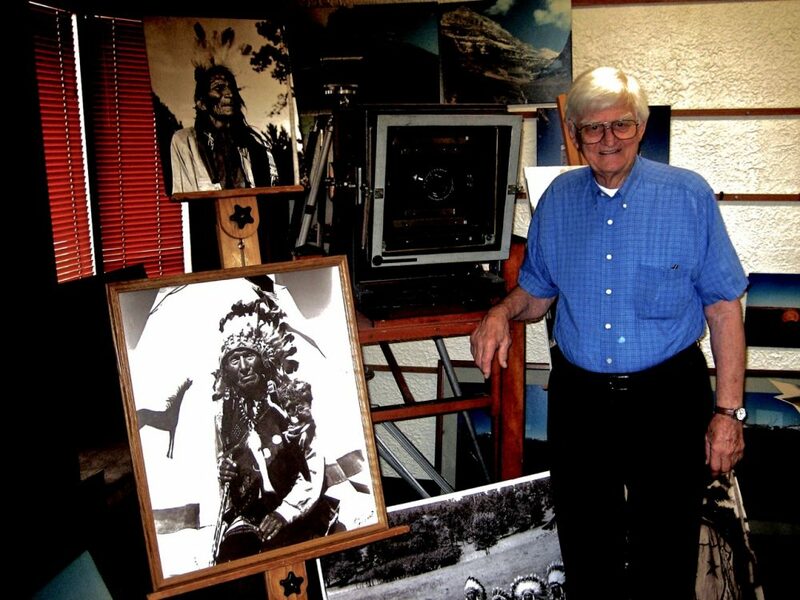 I asked Bill about his Little Bighorn Survivors photographs and he said that his boss Bert Bell at Bell Studios asked him to attend a event at Custer State Park in the Black Hills where the last Lakota-Sioux survivors of the battle would be in attendance. Bill continued by saying that he packed his heavy camera equipment and with twenty-six photographic plates made his way into the Black Hills on the 2nd of September, 1948. There was nine survivors present at the event and all were aged in their late eighties and early nineties. I said to Bill that his images were indeed of the highest quality regarding his composition of the subject matter. And that they were indeed striking to the eye with each old warrior looking proud to be having his photograph taken by Bill. Although Black Elk refused to join the group shot and only consented to having his profile taken. 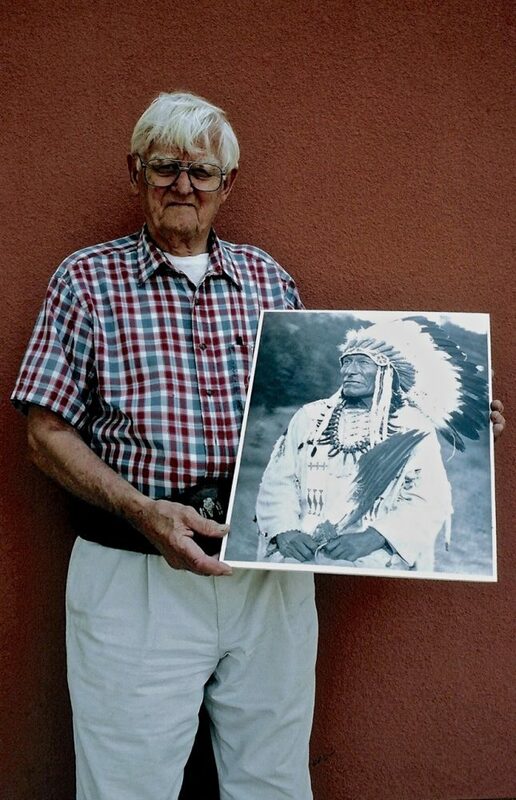 I asked Bill about his portraiture image of Dewey Beard who was the last Little Bighorn Survivor to pass away in 1955. My interest for asking that particular question was Chuck Cochran’s meeting Dewey Beard at a Badlands roadside rest stop in 1948. Bill informed me that Dewey was the last of the nine survivors that he photographed and by that time he had used all his photographic plates but one. Not wanting to panic Bill decided to split the plate and this would allow him two shots of Dewey Beard. This eventually turned out to be a good move as the first shot was blurred and the second shot was sharp and just what Bill had hoped his composition and eye had imagined it would look like when developed in the darkroom. Bill knew this assignment was of historical importance and this was born out when one of the old warriors died weeks after the event. I purchased three large images from Bill and said that I would return for coffee and a chat later in the summer when I was in town. Before departing the store Bill said that the Little Bighorn Survivor negatives had actually been lost for close to forty years and only surfaced again in 1990. Around that time Bill had received a phone call from Bert Bell’s wife from the old Bell Studio days informing Bill that she had come across some negatives that belonged to Bill while she was finalising her recently deceased husbands estate. I left the store and thought that if I had turned up at Bill’s store five years earlier there would not have been a photograph of these majestic Indians to be seen covering the store walls. 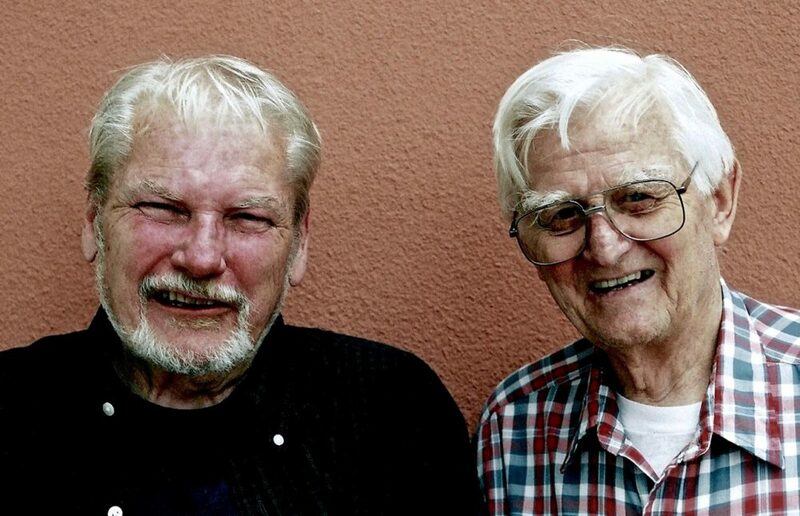 (Pictured below is Chuck Cochran and Bill Groethe in Rapid City, South Dakota, 2008). 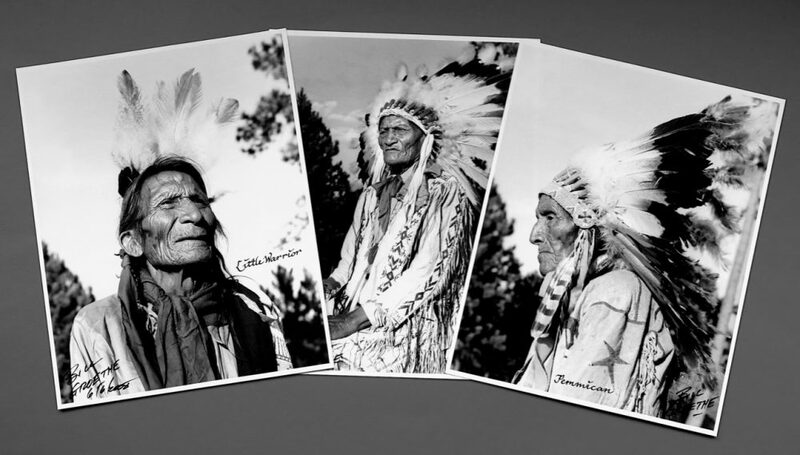 The eleven photographs of the Little Bighorn Survivors that Bill Groethe shot in 1948 are today in great demand and are house in private collection around the world. In recent years Bill and his wife Alice were flown east to be honoured for his work and images by the Smithsonian Institute Museum in Washington, D.C. And Rapid City celebrate the 2nd of September each year as “Groethe Day.” I have personally kept in touch with Bill over the years as our love of photographic film now replaced by the modern age of digital always gives Bill and I a laugh over a coffee when we catch up when I am visiting Rapid City. The art of film photography may well be in its death throws but Bill Groethe’s Little Bighorn Survivors will continue to educate and inspire and in the process give enormous pleasure to interested parties of Lakota-Sioux history and in particular the Battle of the Little Bighorn for decades to come. 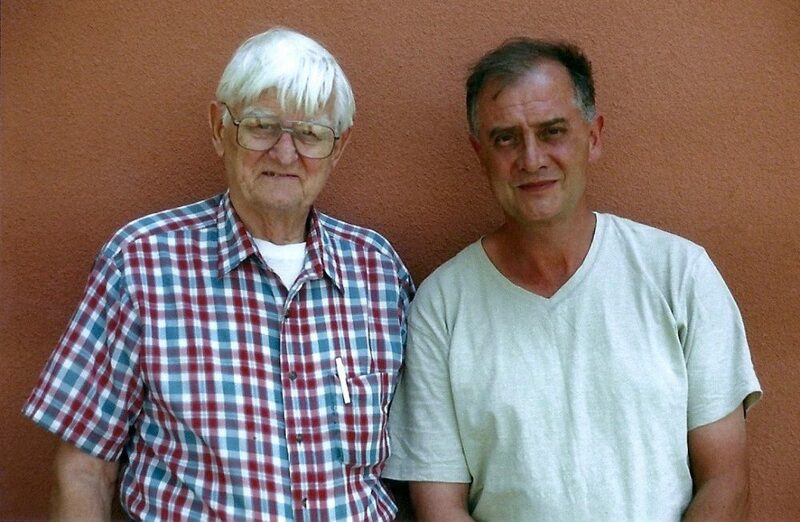 (Pictured below is Bill and I outside his First Photo Photographic Store in Rapid City, South Dakota in 2006). Today at the tender age of ninety-two Bill Groethe lives in Rapid City, South Dakota with his wife Alice. And he still travels up to Mount Rushmore in the Black Hills several days each week and signs prints for sale of his Little Bighorn Survivors to interested parties. Bill’s First Photo Photographic Stores are now closed down with the demise of film in recent years. Although one can pick up the phone anywhere in the world and phone Bill and he will kindly tell you stories about how as a young man that he touched the hands of time. This entry was posted onMonday, May 30th, 2016 at 3:01 am and is filed under Sydney, NSW, Australia. You can follow any responses to this entry through the RSS 2.0 feed. You can leave a response, or trackback from your own site. Both comments and pings are currently closed.